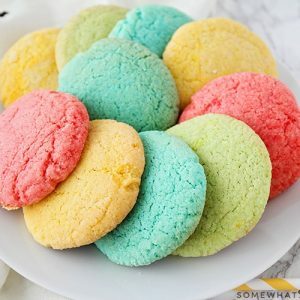 These bright and colorful Jello cookies are such a fun way to get the kids involved in the kitchen, and they're easy to make too! Preheat the oven to 400 degrees, and line two baking sheets with silicone or parchment. Cream together the butter and 1 cup of sugar until light and fluffy. Add the eggs one at a time, mixing well. Add the vanilla and mix until combined. Add the flour, salt, and baking soda, and mix until combined. Divide the dough into four equal portions (one for each color of jello mix), and add 1 1/2 tablespoons of jello mix to each portion. Add 3-4 drops of the same color of food coloring to each bowl. Mix until the color is even distributed throughout the dough. Place the remaining 1/4 cup sugar in a small bowl. Roll the dough into one inch balls, then roll each ball in the sugar. Place on the prepared baking sheets and flatten slightly with a glass. Bake 8-10 minutes, or until the cookies just slightly browned on the bottom and the tops look dry. Let cool 5 minutes on the pan before transferring to a cooling rack.